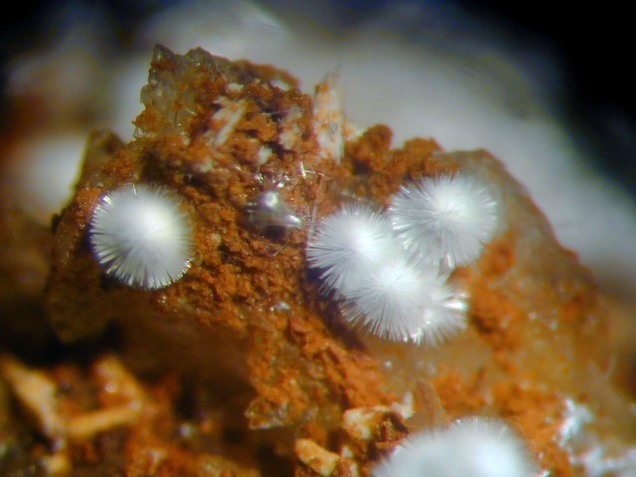 Dundasite: Mineral information, data and localities. 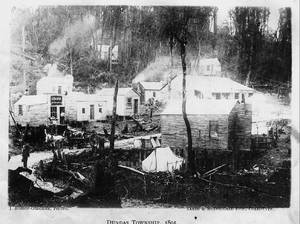 Named in 1893 by William Frederick Petterd after the type locality, Dundas, Tasmania, Australia. Dundasite is a secondary lead mineral found in the oxidization zone of lead deposits. Spherical aggregates composed of radiating crystals, elongated ; matted or felted crusts. Hydrodresserite BaAl2(CO3)2(OH)4 · 3H2O Tric. Petterdite PbCr3+2(CO3)2(OH)4 · H2O Orth. Strontiodresserite SrAl2(CO3)2(OH)4 · H2O Orth. Crocoite 58 photos of Dundasite associated with Crocoite on mindat.org. Cerussite 25 photos of Dundasite associated with Cerussite on mindat.org. Azurite 24 photos of Dundasite associated with Azurite on mindat.org. Malachite 15 photos of Dundasite associated with Malachite on mindat.org. Allophane 10 photos of Dundasite associated with Allophane on mindat.org. Gibbsite 8 photos of Dundasite associated with Gibbsite on mindat.org. Mimetite 6 photos of Dundasite associated with Mimetite on mindat.org. Chrome-Cerussite 6 photos of Dundasite associated with Chrome-Cerussite on mindat.org. Pyromorphite 5 photos of Dundasite associated with Pyromorphite on mindat.org. Limonite 5 photos of Dundasite associated with Limonite on mindat.org. 5.DB.10 Strontiodresserite SrAl2(CO3)2(OH)4 · H2O Orth. 5.DB.10 Petterdite PbCr3+2(CO3)2(OH)4 · H2O Orth. 5.DB.15 Hydrodresserite BaAl2(CO3)2(OH)4 · 3H2O Tric. 16b.2.1.3 Strontiodresserite SrAl2(CO3)2(OH)4 · H2O Orth. 11.9.6 Tuliokite Na6BaTh(CO3)6 · 6H2O Trig. Soluble in acids with effervescence. Petterd, William Frederick (1893) Minerals of Tasmania, Hobart: 66. Petterd, W.F. (1894) A catalogue of the minerals known to occur in Tasmania, with notes on their distribution. Papers and Proceedings of the Royal Society of Tasmania for 1893 1984, 1-72. Prior, G.T. (1906) Dundasite from North Wales. Mineralogical Magazine: 14: 167-169. Russell, A. (1912) Notes on the Occurrence of Dundasite in Derbyshire and Co. Galway. Mineralogical Magazine: 16: 272-273. Russell, A. (1944) Notes on Some Minerals Either New or Rare to Britain. Mineralogical Magazine: 27: 1-10. Palache, C., Berman, H., & Frondel, C. (1951), The System of Mineralogy of James Dwight Dana and Edward Salisbury Dana, Yale University 1837-1892, Volume II: Halides, Nitrates, Borates, Carbonates, Sulfates, Phosphates, Arsenates, Tungstates, Molybdates, Etc. John Wiley and Sons, Inc., New York, 7th edition, revised and enlarged: 279-280. Jambor, J.L., Fong, D.G., Sabina, A.P. (1969) Dresserite, the new barium analogue of dundasite. Canadian Mineralogist: 10: 84–89. Farrell, D.M. (1977) Infrared investigation of basic double-carbonate hydrate minerals. The Canadian Mineralogist: 15: 408-413. Cocco, G., Fanfani, L., Nunzi, A., Zanazzi, P.F. (1972) The crystal structure of dundasite. Mineralogical Magazine: 38: 564-569. The following Dundasite specimens are currently listed for sale on minfind.com. Dana, E.S. (1909) System of Mineralogy, 6th. Edition, New York. App. 2, by E.S. Dana and W.E. Ford: 112; Palache, C., Berman, H., & Frondel, C. (1951), The System of Mineralogy of James Dwight Dana and Edward Salisbury Dana, Yale University 1837-1892, Volume II: 280. N.R. Kemp and R.S. Bottrill : "Crocoite : mine is from which mine", 5th International Conference "Mineralogy & Museums", Paris, Sept. 5-8th 2004, Bull. de Liaison de la Soc. Franç. de Minéralogie et Cristallographie, 2004, Vol 16, N°2. Bottrill, R.S., Williams, P., Dohnt, S., Sorrell, S. and Kemp, N.R. (submitted). 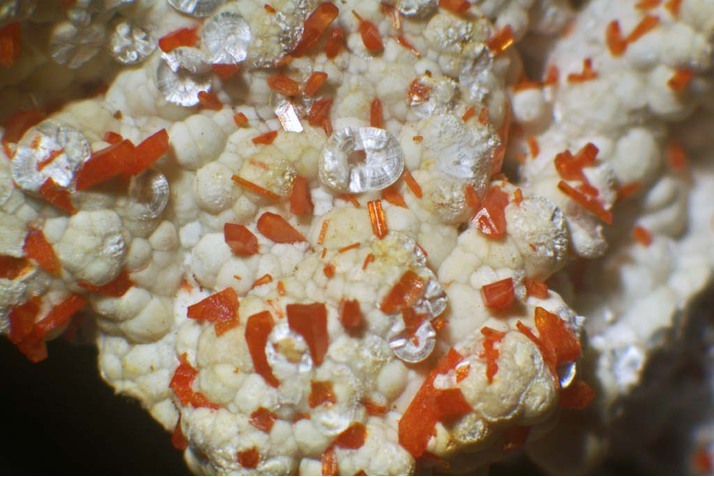 Crocoite and associated minerals from Dundas and other locations in Tasmania. Australian Journal of Mineralogy. [Canadian Mineralogist 38 pp. 1467-1476 (2000)]; Kampf, A. R., Mills, S. J., Housley, R. M., Bottrill, R. S., & Kolitsch, U. (2012). Reynoldsite, Pb2Mn4+ 2 O5 (CrO4), a new phyllomanganate-chromate from the Blue Bell claims, California and the Red Lead mine, Tasmania. American Mineralogist, 97(7), 1187-1192. Leikauf, B. & Bernhard, F. (2005): 1423: Dundasit vom Steinbruch Wolfsgruben bei Seiz (Liesingtal). In: Niedermayr, G. et al. (2005): Neue Mineralfunde aus Österreich LIV. Carinthia II, 195./115., 306. L. Dejonghe et al - Atlas des gisements plombo-zinciferes du synclinorium de Verviers - 1993 - 483 pages. Fojt, B. et al. : Nová Ves u Rýmařova – ložisko olověno-zinkových rud. Acta Musei Moraviae, Scientiae geologicae, 2004, roč. 89, s. 3-44. Pauliš, P.: Die interessanten mineralogische Fundstellen in Mähren und Schlesien. Kutná Hora: Kuttna, 2001. Vernay, R. (1997): Le Crozet (Loire, France). Le Cahier des Micromonteurs, 55(1), 9-22.
ⓘ Le Cantonnier vein ? Meixner, H. (1978): Fibroferrit von Lavrion. Lapis, 3 (10), 11.; Meixner, H. & Paar, W. (1982): New observations on ore formation and weathering of the Kamariza deposit, Laurion, SE Attica (Greece). Special Publication of the Society for Geology Applied to Mineral Deposits 2 (Ore Genesis: State of the Art), 760-767; Hanke, H. (1996): Neues aus Lavrion (II). Mineralien-Welt, 7 (1), 54-56. Palache, C., Berman, H., & Frondel, C. (1951), The System of Mineralogy of James Dwight Dana and Edward Salisbury Dana, Yale University 1837-1892, Volume II: 280. Morrissey, C. J. (1970) The Mineralogy, Structure and Origin of the Lead-zinc-copper Residual Orebody at Tynagh, County Gamay, Ireland (Doctoral dissertation, Imperial College of Science and Technology London). ⓘ Boarezzo Mine (Pradisci prospect; Rio Carpane prospect) ? AA. VV., 1996. Collezionare minerali. Hobby & Work and Orlandi, P., & Campostrini, I., 2006. Boarezzo. I minerali della ricerca mineraria "Pradisci". Rivista Mineralogica Italiana, 30 (1), 14-24. - Stara P., Rizzo R. e Tanca A.G. (1996) : Iglesiente e Arburese. Miniere e minerali. Vol. I (239 pagg.). EMSa Ed. Stara, P., Rizzo, R., Tanca, G.A. (1996): Iglesiente e Arburese. Miniere e Minerali. Edito a cura dell'EMSA e "varie associazioni mineralogiche", Volume 1, 238 pp. Orlandi, P. (2011) : Zibaldone di mineralogia italiana 2010. Micro, 1/2011, 39 - 42. Sabelli C., Olmi F., Brizzi G., Meli R., 1996. Serrabottini (GR): recenti ritrovamenti nelle antiche discariche. Riv. Mineral. Ital., 19: 9-28. P. Rögner, M. Hanauer, F. Senesi (2000) - Elba orientale: nuovi ritrovamenti - Riv. Min. It., 24, 2: 102-109. Boscardin M. et alii. "I minerali nel Vicentino", Museo "G. Zannato", Montecchio Maggiore, (Vicenza) 2011. 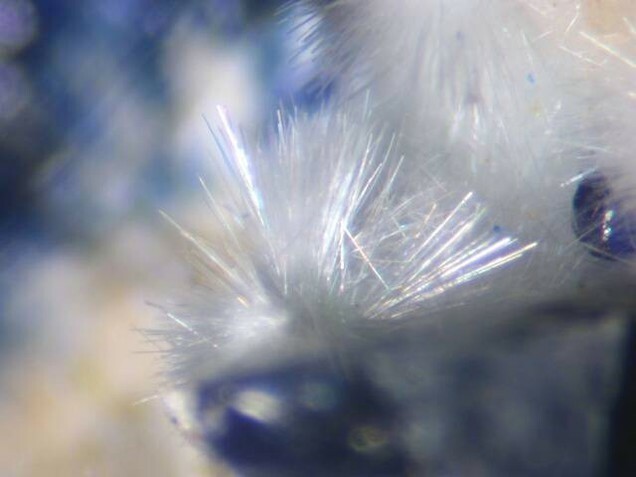 Lapis, 9 (2), 18-25; C. Buscaroli, C. Dal Pozzo, S. Sovilla & F. Tosato (1995): First report of carbonate-cyanotrichite from the Vicenza Province. Riv. Mineral. Ital., No. 2, 185-188. (in Italian); Pegoraro, S., Orlandi, P., Chiereghin, P., Contin, A. & Toniolo, E. (2009). I minerali del Monte Trisa (Torrebelvicino, Vicenza). Rivista Mineralogica Italiana, 3/2009, 160-179. Faheha, A. A., Hamidalddin, S. Q., Al-Turkestany, N. A., & Ibraheim, N. M. (2012). Concentrations Of Natural And Man-Made Radioactivity Of Surface Soil In Al-Madinh Al-Monawarah, Western Province of Saudi Arabia. Isotope and Radiation Research, 44(2), 495-504. Števko M., Malíková R. (2014) Supergénne minerály zo štôlne Juraj, Hodruša-Hámre (Slovenská republika). Bull. mineral.-petrolog. odd. Nár. Muz (Praha), 22, 2, 261-268 (In Slovak with English abstract). Calvo, M. (2009) Minerales y Minas de España. Vol. IV, Óxidos e Hidróxidos. Escuela Técnica Superior de Ingenieros de Minas de Madrid - Fundación Gómez Pardo. 752 pp. (in Spanish). Palache, C., Berman, H., and Frondel, C. (1951) The System of Mineralogy of James Dwight Dana and Edward Salisbury Dana, Yale University 1837-1892, Volume II: 280. John Betterton at Haslemere Educational Museum. Ryback, G. (1992). Eighth supplementary list of British Isles minerals. Adv. Sci, 875, 7.; Alabaster, C. (1990) New occurrences of secondary aluminium minerals from the Bristol District. J. Russell Soc., 3, No. 2, 49-59. John Cianciulli, Curator, Franklin Mineral Museum, analysis by Malcolm Back, Royal Ontario Museum. Min Rec 20:1 pp13-24; Ex. New Mexico Bereau of Mines and Mineral Resoursces Museum, now in the collection of Alex Earl.